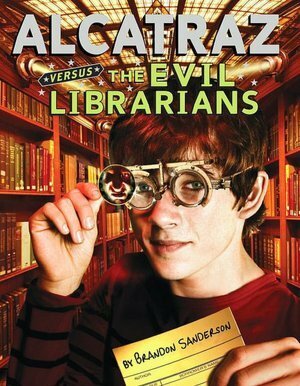 I thoroughly enjoyed Alcatraz versus the Evil Librarians. In fact, I’ve already checked out the second book in the series from the library! Alcatraz Smedry had grown up in foster homes, moving from one to another due to his habit of breaking things–ALL kinds of things, pretty much everything he touches. When he turns thirteen and receives his “inheritance” from his biological parents in the mail–a package of sand–Alcatraz thinks his life has sunk about as low as it can go. And so has his outlook on his future. Then the sand is stolen and a man appears who claims to be his grandfather. Alcatraz learns his biological family is extremely gifted in curious ways and exist in the Free Kingdoms (rather than the Hushlands where he has grown up). Alcatraz is exposed to a wealth of new ideas which challenge everything he has grown up believing to be true. Alcatraz, still not completely believing the old man, agrees to accompany his grandfather on a mission to retrieve his inheritance. From the moment this quest begins Alcatraz’s world will never be the same. The author warns the reader at the beginning that although this book was probably listed as fiction in the Hushlands (where we live) it is, in fact, a true chronicle of how the world truly exists. (“Brandon Sanderson” is the pen name for Alcatraz, himself. )This is a terrific book to introduce middle grade readers to dystopian literature, while maintaining the humor, adventurous (almost super-hero-like) good-versus-evil battles and quests, and delightfully quirky characters of more common mystery/adventure novels for upper elementary readers. The Smedry family talents seem ludicrous and hilarious on the surface: the ability to arrive late to things, the ability to speak nonsense words, the ability to trip spectacularly…but the author skillfully turns what originally appear to be silly attributes into fantastically creative–and incredibly useful–abilities when battling the danger from the Hushlands. The message overall is : knowledge is power. Alcatraz’s family fights for the ability of all who exist to have access to all available knowledge, while the cult of Evil Librarians–seriously, the librarians we know and love in our own lives–seek to only allow us limited access to the available knowledge of the universe. The book does a great job creating a story in which the rigid good-versus-evil idea exists alongside the complicated, genuine emotions and confusion of Alcatraz, an authentically thirteen-year-old boy with some of the same wounds and resentments his readers will recognize in themselves. The ending brilliantly combines a satisfying conclusion for the story of Book One and an intriguing beginning for the story waiting in Book Two! For any reader who enjoys magic, adventure, superhero good-versus-evil storylines and humorous characters–Alcatraz versus the Evil Librarians is worth a look!